New officer Christoper Nieves listens to police chief Ray Osborne at the Darien Police's swearing in ceremony at the Darien Community Association in Darien, CT on April 5, 2017. 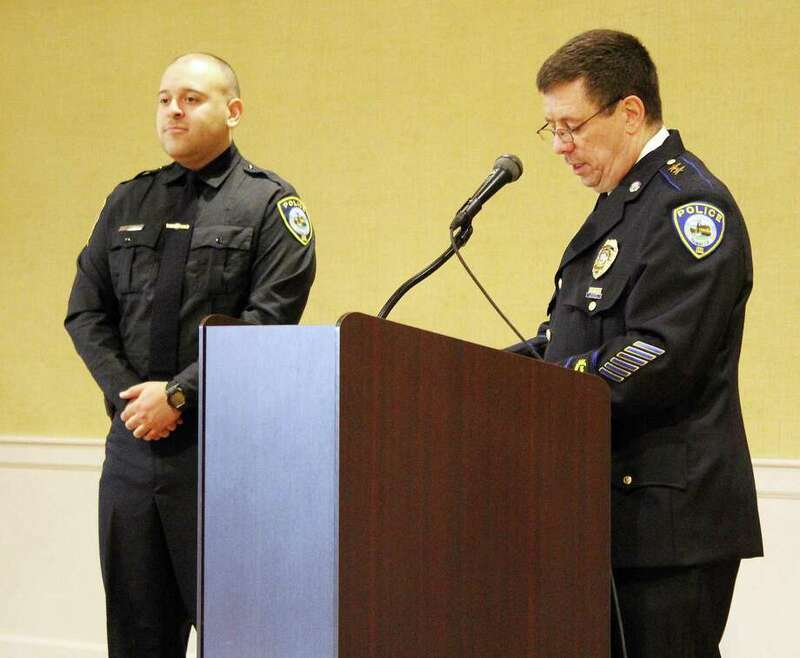 DARIEN — It’s been almost one year since Ray Osborne was named chief of the Darien Police Department. Despite having served only six months as captain before being promoted to the department’s top spot, he said not much has surprised him about the job, except for one thing: paperwork. Osborne said he’s been busy with paperwork over the past several months as he helps prepare the department’s proposed budget and their re-accreditation process. However, he’s also spent the last year working on continuing the department’s new initiatives. Osborne said programs the department has released in the past several years — use of civilian dispatchers, installing a juvenile review board and equipping officers with body cameras — have all been moving along well. The body cameras in particular, which were the source of some controversy when first introduced, have since been well integrated into the department. Osborne said the body camera program, which has been approved budgetarily for a second year, has mostly been used for officers to review their own footage, as well as given out through FOI requests from accidents. Osborne’s first year has not been without some controversy though. In November, Darien was named in a study from the Connecticut Racial Prohibition Project at Central Connecticut State University, for pulling over a high number of minority drivers, specifically drivers who are Hispanic. At the time of the report, Osborne said the department would gather its own statistics on the town’s estimated driving population which would include cars driving through off the interstate. He also added the study results isn’t changing the way the department does its policing. “We told them ‘don’t let it change the way you do your job.’” he said. “We can’t do that. I don’t think there’s any officer here that racially profiles. I’ve worked with a lot of these guys for many years. I’ve never seen any evidence of it. I don’t want it to change the way we do business. We’ve pointed out to them the way we’re laid out with Norwalk and Stamford and I-95 going through Darien, it’s just a way of life here. We reiterate we want people treated fairly and impartially and we treat everyone with dignity and respect.”. As his one year anniversary approaches, Osborne is also beginning the process of hiring two new officers for the department to bring them up to full staff from 49 officers to 51. Future goals also include looking into expanding the school resource officer roles, as well as getting more crisis intervention training for officers to help them handle calls involving people struggling with their mental health.